Depending on how messy a lifestyle you lead, laundry is likely one of those ever-present bullet points on your to-do list. Whether you want to try out another DIY project, or maybe you are sensitive to some laundry soap ingredients, there are many reasons to make your own homemade laundry detergent without Borax. There are numerous benefits to making laundry detergent. For one, homemade laundry soap is very low-cost. In addition to savings, there’s also the convenience – you can make one big batch in a day that can last you months on end! Plus, when you follow a hand-picked laundry detergent recipe, you know the exact ingredients that will be going into your washing machine. Perhaps the best reason of all to make homemade detergent is that it is easy! All it takes is a quick peek at the ingredients you have in your kitchen, or a trip to the grocery store, plus about 10 or 20 minutes to whip it all together, and you’ll have natural, safe, and effective DIY laundry detergent without Borax. 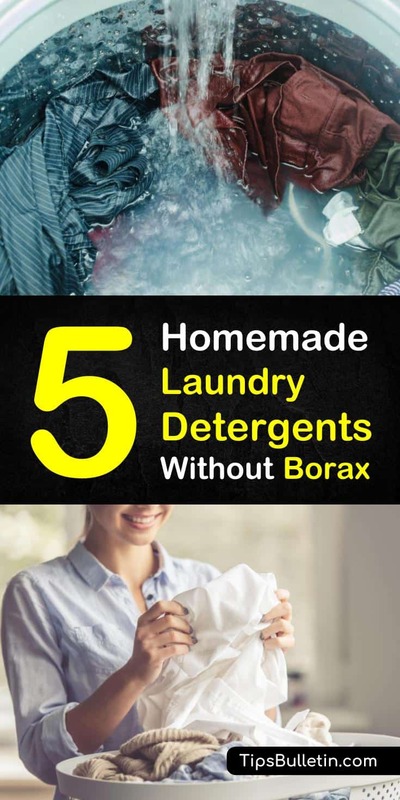 In this article, we’re sharing 5 of our favorite Borax-free detergent recipes that you can make yourself! This natural laundry soap recipe is one of our favorites because it is not only cost-efficient, but it is also eco-friendly. It uses only non-toxic ingredients that score an A with the Environmental Working Group (EWG) when it comes to healthy cleaning products(..). With so few elements, this recipe costs about $0.24 per load. Start by bringing the 5 cups of water to a boil. In a separate glass bowl, pour in the washing soda before slowly stirring in 2 cups of the boiling water. Stir until the washing soda dissolves. Add in the baking soda one tablespoon at a time, stirring until combined. The mixture should thicken up after this step. Next, mix in the Castile soap until the mixture is well combined. Slowly mix in the remaining 3 cups of boiling water. Allow the detergent to cool, leaving it overnight. The mixture will separate, so you will need to stir or whisk this liquid detergent until smooth before using it. Store in a glass bottle and use 1/3 cup at a time. This detergent recipe requires a few more ingredients than the last one, but is even better for savings at just $0.13 per load! To start, finely grate the bar of Castile soap—we recommend Dr. Bronner’s soap nuts, as it works great to remove grease stains from clothes—either by hand or using a food processor. Transfer the grated soap into a large bowl and combine the remaining ingredients. Stir until well mixed. If you find the mixture is clumpy, consider using a pastry cutter to keep separate it. Store the detergent in an air-tight container and use one tablespoon for a load of laundry. If your clothes are particularly dirty, you could use two tablespoons. This liquid detergent recipe also contains no Borax. 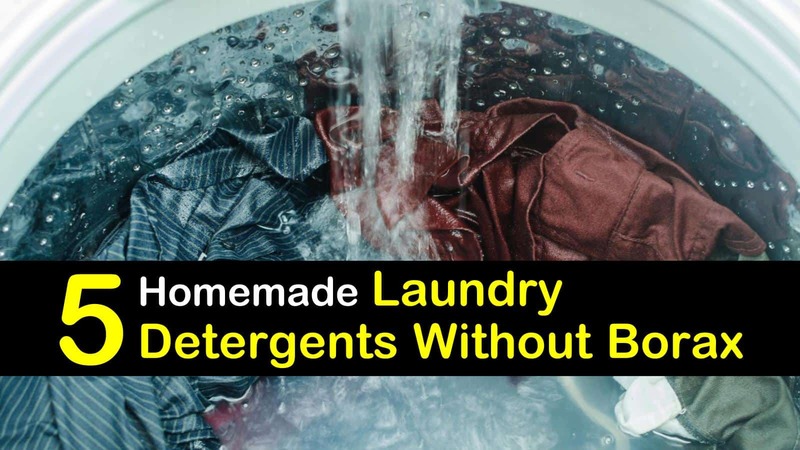 It will get the dirt out of your clothes and leave them smelling fresh, and because it doesn’t create many suds, it is a detergent that will work great in a HE washer. For this easy recipe, pour the hot water, baking soda, and salt into a gallon-sized jug. Put on the lid, sealing it tightly, and shake well. Open the container once more and add the Castile soap and add in the drops of essential oils. Pretty much any kind will work, but we like lavender and lemon the most. The ingredients will separate, so you’ll need to give it a good shake before using about 1/4 cup for your load. If you have a bunch of cloth diapers you need to clean or are looking for a DIY soap suitable for handwashing clothes, this might be the one for you. As it is also low sudsing, this detergent works in high-efficiency machines. Cut the bars of soap into small chunks and then combine with washing soda in a food processor. Blend into a fine powder. To avoid powder flying all over, wait to remove the lid until the dust has settled. Transfer detergent to a clean container. To do laundry, add 2 to 3 tablespoons to your load. If you want to use this detergent in cold water, dissolve it in a small amount of hot water before adding it to your washer. If using with a HE machine use half. It may sound simple, but adding white vinegar to laundry can make a huge difference for your clothes. By adding in 1/2 cup of vinegar to the rinse cycle, any residue left behind by your homemade detergent will dissolve, leaving your clothes cleaner and brighter. Pour the vinegar into the fabric softener compartment of your machine. Vinegar is also a great stain remover for any sticky substance. If you don’t have any Fels Naptha on hand, then you can pour some distilled vinegar on the stain. Let it sit for a few minutes before putting the clothing item in the wash. These homemade laundry detergent recipes will keep you looking and smelling fresh, all without using Borax! While the recipes listed here work great for us, you might need to make little adjustments to get the results you want, especially if your washing machine uses hard water. The amount of detergent may also vary by the washer, as a front loader needs less soap than a top loader. Making your own detergent without Borax can be a fun and rewarding experience, and the more comfortable you get with these recipes, the more you can experiment with different combinations to find what works best for your clothes and your machine. We hope you found these homemade laundry recipes helpful! If you found a DIY laundry soap that works for you, then share the detergent recipe with your friends and family online!